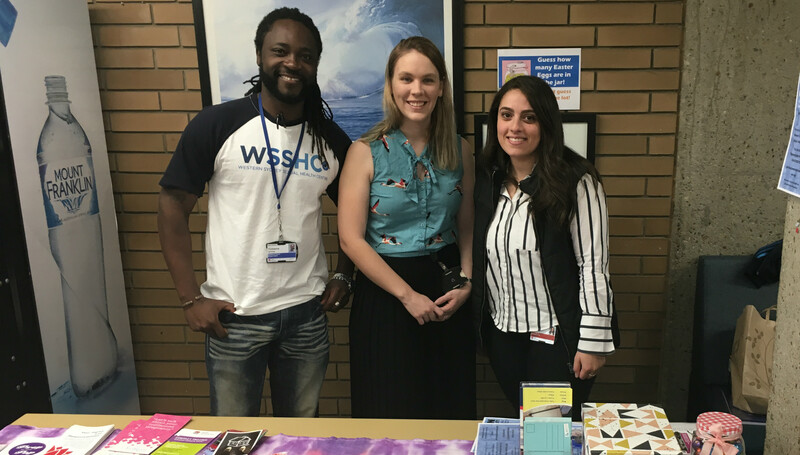 Jacinda Beadman from Parramatta Mission, WSLHD Youth Health counselor Cassie Scott and WSLHD Youth Council member Shannen Twine at a Westmead Hospital Youth Week stall. Healthy lifestyles, health literacy and access to youth friendly services were the hot topics at Westmead Hospital yesterday in celebration of NSW Youth Week. The annual government initiative proved the perfect opportunity for Western Sydney Local Health District’s Youth Council to host a fun, educational event for young people in the area. Activities included interactive games, a place to celebrate young people, and a question box – the answers to which will be shared on the WSLHD Youth Council Facebook page. Drug Health, Sexual Health, Youth Health and other service providers were there to share information about support and services available for young people in Western Sydney. Youth Transition Care project officer Molly Sinclair said NSW Youth Week is an important opportunity to celebrate the achievements, strengths and opportunities for young people in Western Sydney, and acknowledge their positive contribution to our local community. “By hosting a stall in the hospital the Youth Council wants to learn from other young people about what their priorities for health are, what opportunities there are for health services to better cater to young people, and raise awareness of the many youth services available in western Sydney,” Molly said. The event was organised by the Youth Council and Sydney Children’s Hospital Network Youth Advisory Group, and featured representatives from organisations that support young people in western Sydney, including Parramatta Mission, Head FYRST at Headspace, and Evolve Housing for Youth. WSLHD Sexual Health nurse Tichaona Jaricha with WSLHD Youth Council members Shannen Twine and Lauren Moujalli. Molly explained the purpose of the Youth Council year-round is to improve the care and delivery provided by services for young people. “The Council assists in contributing to the development of an adolescent and young adult health voice in the local health district,” she said. Coleman Greig Challenge: Your training starts … NOW!